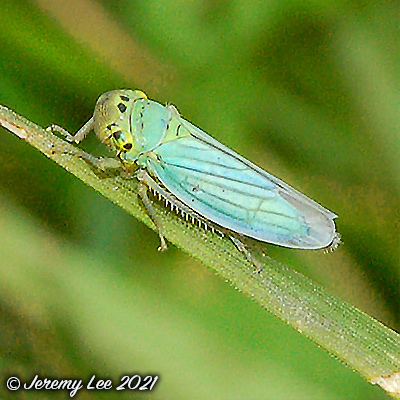 With a length of 6-8mm, Cicadella viridis, more commonly known as a Green Leafhopper, is a largish, attractive species which is widespread and common in damp grassy and marshy areas throughout the UK, although they can be encountered in drier areas too. The bicoloured pronotum (yellow at the front and green at the rear) is distinctive. The female's forewings are bright turqoise green, but the male's can be much darker blue-purple and may even appear blackish. The front of the head is pale yellow, with two black spots near the compound eyes. Adults are active July-October. The larvae are yellowish and have two brownish stripes running from head to the end of the abdomen. Cicadella viridis may have one or more generations per year. This species overwinters in the egg stage.